What would you do if you could hear the Earth asking for help? In the Gaia Girls book series, that is what happens to four girls, each from a different region of the world. They are approached by Gaia, the living organism of the Earth. Each is endowed with powers over one of the four elements: earth, air, fire, and water. They must learn to use their powers to help Gaia survive the effects of modern humanity. The first book centers around a girl named Elizabeth Angier and one very eventful summer at her family farm in New York state. She and the family’s undeniably lovable dog Maizey take on a big business factory farming operation that is trying to buy up all the farms in her town. On top of that, her best friend is moving not only out of town but out of state to Florida. Just as her troubles start to reach their boiling point, Elizabeth is greeted by an eager otter named Gaia who will change her world forever. 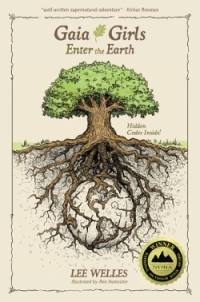 Enter the Earth is a quick and enjoyable read that I would recommend to everyone from age 9 to 90. The book has already won two national awards and a new dedicated reader – me (and hopefully you very soon). While the topic of factory farming might seem a bit heavy for young kids to delve into, it is presented in an intelligent and logical way that will appeal to the eager sense of learning that our little ones are blessed with. At the end of the story, a collection of word finds and illustration puzzles are included, along with discussion questions for you and your kids to ponder together. Poised to be the eco-Harry Potter or a New Age Babysitters’ Club, the Gaia Girls series is off to a very noteworthy start. I love the hidden clues in the cover illustration and the beautiful drawings that accompany every chapter! Its contained that it has real characters leading real lives. The spiritual connection to our world is handled delightfully and carefully. The spiritual aspects are not connected to organized religion, but to a love for the planet and all that it holds. Thanks for doing the review, I think getting kids to become aware of the environmental problems is essential, and this is a great way to do it. Lets hope they grow up and help solve our problems. I’ll be reading this to my kids tonight. Great story! My kids LOVE this series! Gaia Girls has great ‘real’ characters, real-world problems and a fantastical element that my “Harry Potter” kids just loved. I hope you will review the second book. My kids were inspired by both and can’t wait for the rest of the book series. (is it 7 books?) I know my kids can’t wait to read when the girls try/work together to solve new eco-issues. Great job and please parents, lets all spread the word about this well-written and worthy Gaia Girls book series. If we all do a little, its A LOT! PS… I can’t see the cover of the book. Can you guys fix the post???? Do You Need a UV Pocket Purifier?